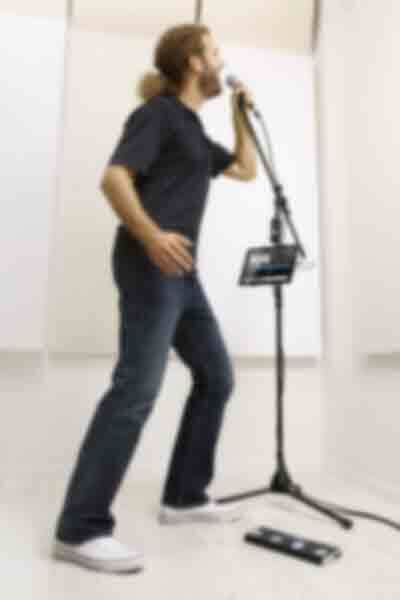 iRig BlueBoard features four backlit soft-touch pads housed in a sturdy, stage-worthy chassis. Two TRS expansion jacks for connecting additional MIDI controllers like expression pedals. And it's powered by four standard AAA batteries. 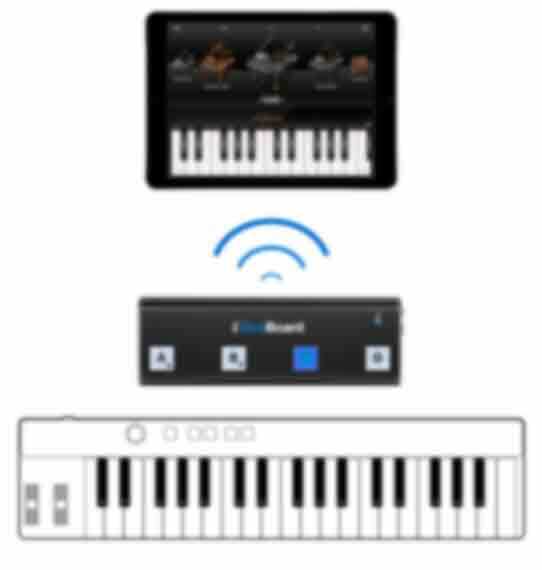 iRig BlueBoard's latest firmware supports Apple's Bluetooth LE MIDI for iOS and OS X (read more about the firmware update here). Apple's Bluetooth LE MIDI protocol transforms all MIDI data transmitted over Bluetooth into core MIDI data for simple, plug-and-play use with any MIDI over Bluetooth compatible app on both iOS 8 and above and OS X Yosemite and above. 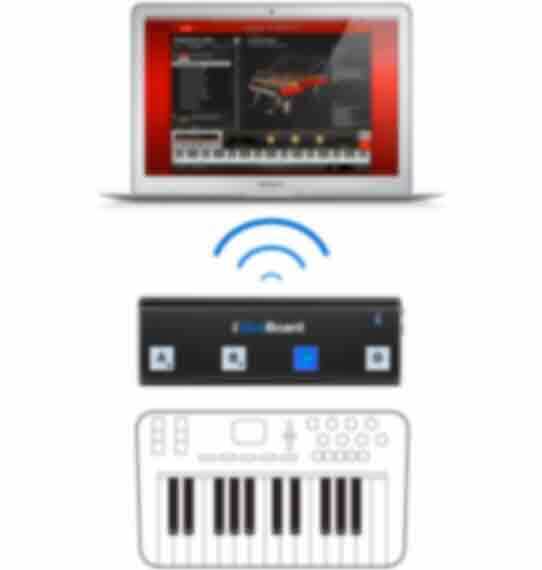 iRig BlueBoard can be used in different modes to send different kinds of MIDI control information. 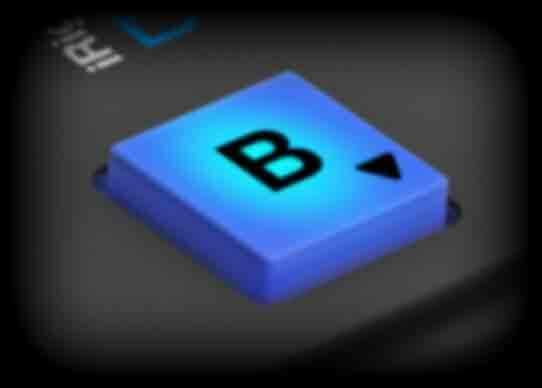 The first mode allows iRig BlueBoard's 4 buttons to be used to send MIDI note on/off information to apps like SampleTank or iGrand Piano. 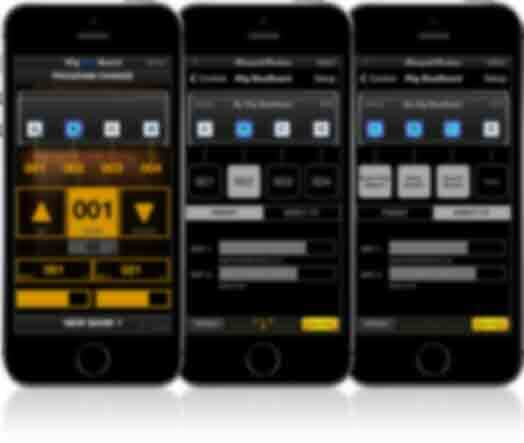 The second mode works similarly, except that it sends MIDI CC on/off information, which is perfect for triggering apps like AmpliTube, allowing users to stomp their favorite effects on and off just like a physical stompbox. 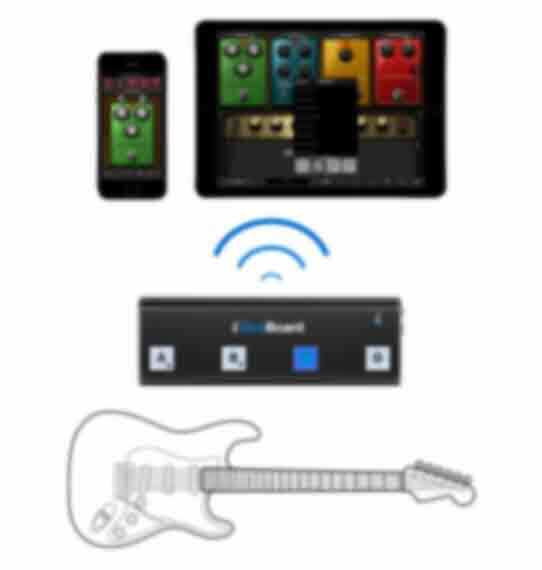 In addition to these apps, iRig BlueBoard can also be used with many popular third party apps and software, like Apple's GarageBand. 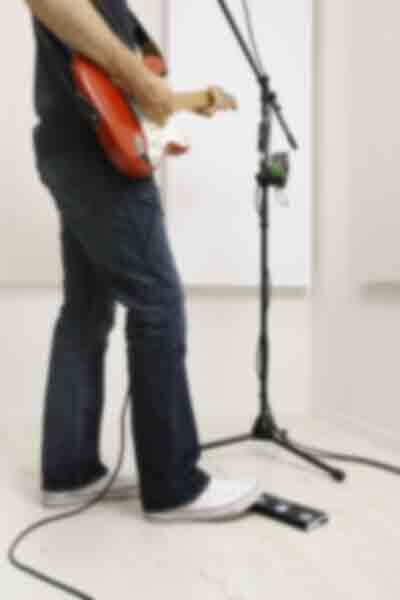 iRig BlueBoard works seamlessly with AmpliTube. 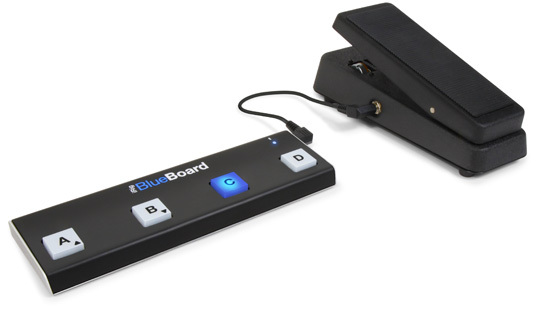 To use them together, all you need to do is find your iRig BlueBoard device in AmpliTube's integrated BlueBoard section and you'll be ready to go. You get a PRESET mode (to browse presets), a DIRECT FX mode (to control single parameters, like switches and knobs) and a new "Global Controls" feature that lets toggle the tuner, switch banks and presets, control the recorder and a whole lot more. Pair iRig BlueBoard with the latest version of AmpliTube and get full control — all without using your hands. 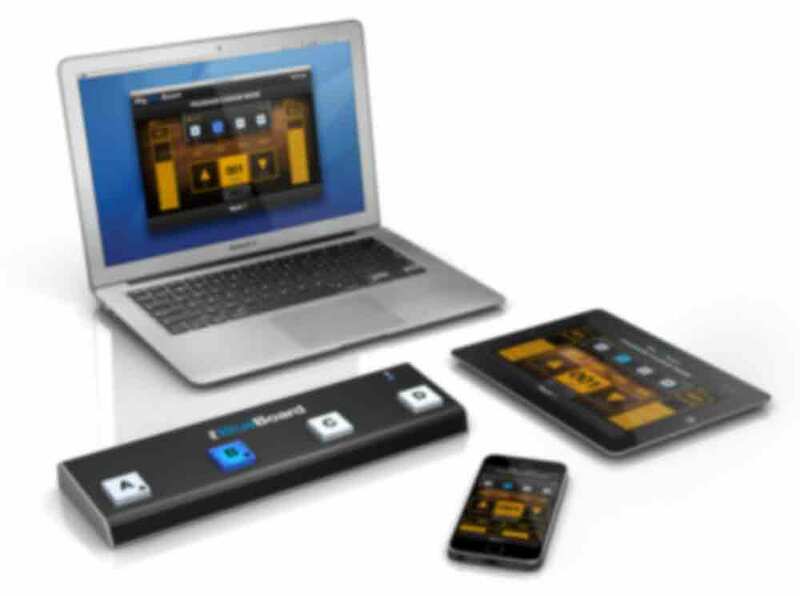 iRig BlueBoard communicates via Bluetooth technology so you can place it up to 10 meters (32.8 feet) away from your device and still maintain full control of your apps. The low-profile iRig BlueBoard is only 9.1” (23cm) wide, and it runs on 4 - AAA batteries. 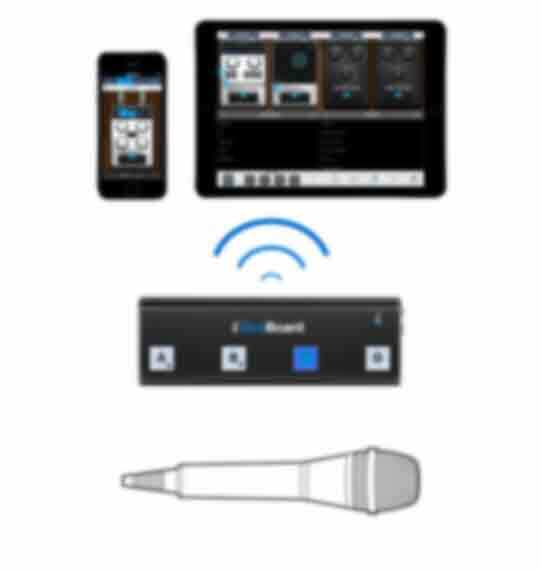 Because it communicates with the mobile device via Bluetooth, it leaves the 30-pin, Lightning and mini-jack connector on the mobile device free for connection with other IK accessories like iRig Pro Duo, iRig Pro, iRig HD, iRig Stomp, iRig 2, iRig Mic, iRig MIDI 2, iRig Keys or any other favorite accessory. 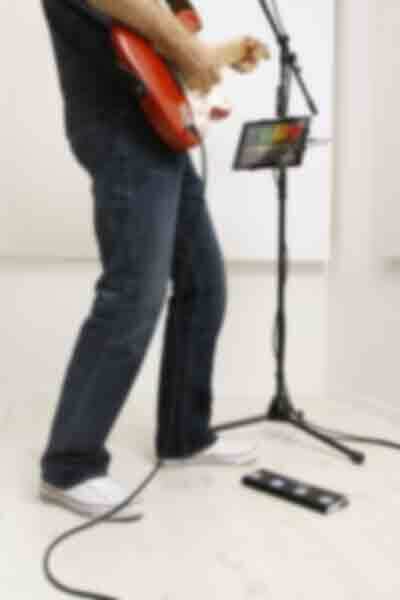 iRig Blueboard has 4 backlit control pads housed in a sturdy stage-worthy chassis. 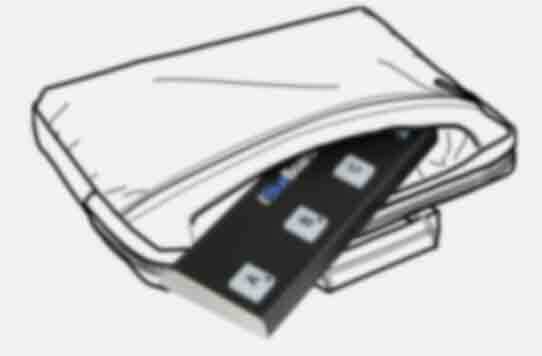 Each pad has an additional LED that lights when the pad is active, letting you know exactly which control is on. And since it’s backlit, you can easily see it on a dark stage or performance venue for quick and accurate access. 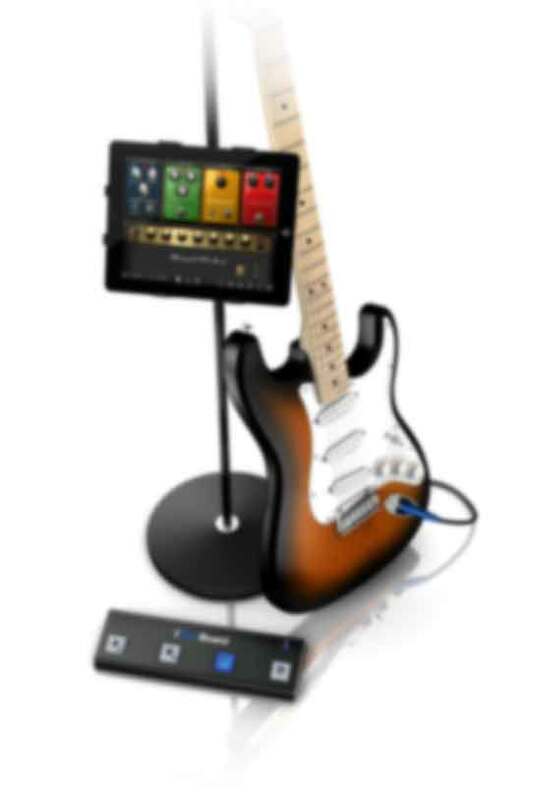 Guitar, bass and keyboard players and singers will now be able to play and control their preferred iOS apps on stage or in studio, with the same degree of performance control offered by traditional music hardware and the freedom of not being tethered by cables. Plus iRig BlueBoard is small enough to fit in a laptop bag. iRig BlueBoard companion apps for other computer and mobile platforms will also be available the near future.